Available Colors: Pewter/Black, Royal Blue/Black, White/Royal Blue, White/Teal, White/Red, White/Green, White/Black, Khaki/Navy, Khaki/Maroon, Khaki/Black, Khaki/Forest Green or Red/Black. Combo: Red/White/Royal Blue. Solid: Royal Blue, Khaki, Red or Green. Shipping Weight: 25 per carton @ 35 lbs. 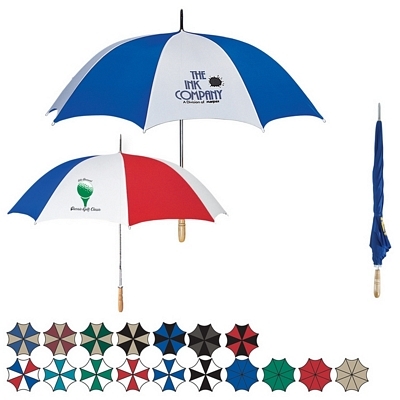 Customized 60" Golf Umbrella with Wooden Handle Item #HT-4021 (Minimum Order: 25). Promotional Umbrellas like the 60" Golf Umbrella with Wooden Handle can be personalized with your business logo and with No Setup Fees. Customized 36" Arc Telescopic Folding Automatic Umbrella Item #HT-4022 (Minimum Order: 50). 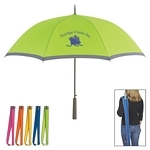 Promotional Customized Umbrellas can be personalized with your business logo. 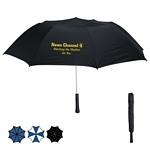 Our Promotional Umbrellas are decorated with No Setup Fees. Customized 46" Arc Two-tone Umbrella Item #HT-4025 (Minimum Order: 25). Promotional Umbrellas like the 46" Arc Two-tone Umbrella can be personalized with your business logo and with No Setup Fees. Customized 37" Arc Folding Travel Umbrella with Eva Case Item #HT-4027 (Minimum Order: 25). Promotional Customized Umbrellas can be personalized with your business logo. 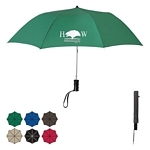 Our Promotional Umbrellas are decorated with No Setup Fees.